Vitamin D levels in pets- are they getting enough? Most of us know about the importance of Vitamin D in maintaining not only healthy bones, but in the function of the immune system and preventing cancer. Most physicians recommend that people in the northern half of North America take between 1000 and 3000 IU daily over the winter months when there is not enough exposure to sun for our bodies to produce this essential vitamin. What about our pets? Unfortunately our companion animals do not even produce Vitamin D from sunshine in the hottest sunniest summer months as their skin lacks the enzyme to convert sunshine to the vitamin that we all need. Almost 100% of their vitamin D must be taken in from the food. A recent study showed that a majority of dogs are lacking this essential vitamin. This was true for dogs on commercial diets as well as on home prepared diets . But some dogs eating the same food had low levels and other had adequate levels. What does this tell us? There is no way to know if your pet has enough Vitamin D without doing a blood test. Once the test is done we can tell if the level is in the optimal range, or if a supplement needs to be given. Disorders of the bowel and kidney can lead to low levels so it is especially important for dogs and cats with those illnesses to have their levels tested. A simple blood test can give us the answer, and the sample can be drawn at the same time as other early-detection and wellness blood screening tests. Over the past few months I have been routinely running the Vitamin D level test, and the results to date show that an overwhelming number of my patients are deficient in Vitamin D and require a supplement. For many people, the cutest dog breeds are the small ones; dacshunds, poodles, bichons, shi-tzus and others typically referred to as toy breeds. Unfortunately these breeds are also over-represented in the caseload of patients with intervertebral disc disease, also referred to by its initials IVDD. It is sometimes called a “slipped disc” or “herniated disc”. It is caused by degeneration of one or more of the shock-absorbing pillow-shaped discs located between the vertebral bones of the spine. 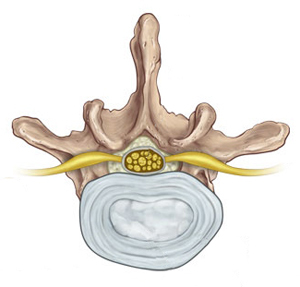 These discs can become hardened and stiff (calcium deposits form inside them) causing bulging of the disc into the spinal canal, or they may rupture, letting the soft jelly-like material they contain out into the canal. There is really only enough room for the spinal cord in the spinal canal, so it gets compressed and sometimes irreparably damaged. When the spinal cord or the nerves passing out of it to the body are compressed, pain and impairment of neural function are the result. Some dogs show minimal symptoms but stop doing things that hurt such as going up or down stairs, jumping on the bed or going about their usual activities. An observant guardian may sometimes notice a change in gait, a wobble or hitch in their step, especially when turning or changing directions. Others may have severe and unrelenting pain and refuse to move, eat or void their bowels or bladder. in the most severe cases there is no pain- all sensation and movement beyond the location of the spinal cord damage is lost, resulting in complete paralysis. Damage to the spinal cord causes a loss of communication between the brain and the body. Most dogs that have grade 2-4 IVDD will remain permanently impaired, if they are able to regain their ability to walk at all. 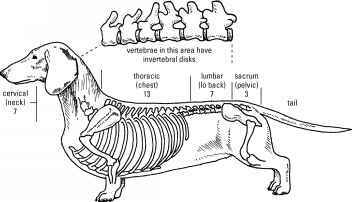 There are 27 discs (or more in some long-backed breeds such as dachsunds, basset hounds and corgis) between the vertebral bones from the nape of the neck to the tail. Since the disease in a degeneration, multiple discs may be affected. A recent veterinary study at The Royal Veterinary College in the United Kingdom established a relationship between long backs, short legs and IVDD. Early treatment is critical for IVDD. In cases of unrelenting pain or paralysis, an MRI of the spinal cord to determine location of damage followed immediately by surgery to remove the herniated disc material is usually recommended. Unfortunately this surgery only has a success rate of 50%. Intensive acupuncture with electrostimulation and physical rehabilitation is essential for return to full function, or as full as posible depending on the extent of spinal cord damage. For back pain only with no loss of nerve function (such as loss of spatial sensation, called proprioceptive deficits) the treatments are started at twice a week and taper quickly to once a month for maintenance. For paralysis the treatments will be daily to every third day until sensation returns. Nursing care for these dogs is critical, as bladder and bowel function is lost as well. Poor hygeine can lead to bedsores, bladder infections and painful skin rashes. So if you have a long-bodied, short-legged dog in your family, be aware of this devastating disease and keep an eye out for the little signs you might otherwise miss. Regular acupuncture treatments can not only help keep your dog’s back flexible and healthy but the veterinary acupuncturist will check for subtle signs at every visit to catch and treat dysfunction before pain and disability occur. It breaks our hearts to see a loved one in pain. Too often we miss the signs in companion dogs and cats because they are very subtle. If pain is acute, like when a puppy plays too roughly at the park, he squeals, and we know that he is hurt. But adult dogs can be very stoic and not vocalize at all, even when in extreme pain. Chronic pain is even more challenging because the animal has learned to expect it and is dealing with it at all times. Cats especially do not show symptoms that are easily recognizable. Cats that display any weakness such as pain are at risk of becoming another predator’s meal; they instinctively mask pain. The signs of pain are so very subtle that it is easy to miss them unless you are extremely observant and spend a lot of time with the cat. Often they stop doing the things that are difficult for them like jumping up on the counter or playing with their toys. We often assume they are “just getting old” because their activity level declines, and the changes are gradual. We used to miss a lot of pain in veterinary medicine practice, but we are getting much better now at identifying and treating it. What I really want to talk about is how to treat pain safely and naturally with herbs, and let you know which can be safely combined with narcotics, non-steroidal anti-inflammatories (NSAIDS) or both. First of all I need to get something off my chest. One of my pet peeves is the issue of over-the-counter supplement quality and safety. Many products have no third-party evaluation for purity and potency, and even have inaccurate or missing label information on the exact source and processing of the herb. In my practice I only use professional-grade products from companies I trust, who share manufacturing details such as GMP and ISO certification, and use DNA or chemical “fingerprinting” to ensure that the plant material is the correct species and potency. Most are members in good standing of industry associations such as NASC . These products are more expensive than some out there in the online stores and local pet shops. You usually get what you pay for. Now, on to what you are really here for…. Turmeric, Curcuma longa (root), which contains curcumin, is one of my favourite herbs for pain releif, but it has very LOW bioavailability as a raw herb powder. It acts on nitric oxide pathways instead of the COX pathways that NSAIDS block, so it is safe to combine with those drugs. Use the raw powder mixed with fat in a home-cooked meal or “gravy” for your pet to increase absorption or choose a cucurmin product that is complexed with lecithin or choline so your pet can benefit. In Traditional Chinese Medicine, the different parts of the root are used differently. The Rhizome, Jiang Huang is used more for pain, especially in the forelimbs, while the Tuber, Yu Jin is used more for liver disorders. Alfalfa, Medicago sativa (above-ground parts: leaf, stem and flower) is a nourishing and restoring herb. It is usually used as a componant in herbal formulas for pain, not often on its own. Constituents include phytoestrogens, Calcium, vitamins A, C, E, and K, saponin, and phenols. Corydalis, Corydalis ambigua (root) called Yan Hu Suo in chinese is an excellent analgesic, especially for cancer pain. It inhibits dopamine release in the brain, so caution should be used if combining with medications that change dopamine levels. It lowers blood pressure and interacts with calcium channel blocker heart medications. As well, it can inhibit platelets which potentially leads to increased risk of bleeding, of special concern if surgery is planned. Many more herbs are used for pain, and will be explored in future posts. Before using any supplement for your pet, please consult with a qualified veterinary herbalist. To find a qualified veterinary herbalist near you, check VBMA’s practitioner list. I was very excited to learn about this groundbreaking long-term study. It is unique in the collaboration of a very diverse group of company sponsors, and I believe it is is the first comprehensive longitudinal study in dogs. Similar studies in people, such as the Nurse’s Health Study, have revealed very important results that are used today in health maintenance, as well as providing directions for future research. This long-term study will follow 2,500 Golden retrievers through their lifetimes to learn more about the nutritional, environmental and genetic facts that influence the development of cancer in this breed. Learn more by watching these videos. I recently had a question about what can cause shaking, especially in the legs of an older dog. The most common cause of shaking legs in the young dog that I see is fear- these are dogs that do not want to be in the examination room! But for the older dog shaking at home, muscle weakness is often the root cause. Several systemic illnesses can result in muscle weakness. Kidney disease often causes loss of muscle tissue as well as imbalances in the electrolytes, various minerals that are essential for muscle function. Adrenal gland disease can also cause muscle loss and electrolyte imbalances. Cancer must always be on the list as well, due to the unpredictable nature of the disease. Systemic disorders are diagnosed with blood and urine testing, sometimes x-rays and ultrasound as well, usually on an outpatient basis. Therapy can include dietary modifications, mineral supplementation and physical therapy, as well as medications where needed. Pain from arthritis is an often unrecognized factor in shaky legs and muscle weakness. When it is more difficult to get up and move, your pet exercises less, and muscles gradually atrophy. While leg joints such as hips, knees and elbows are often affected, don’t forget all the joints in the back. As many of us know, when the back hurts, everything hurts. Acupuncture and cold-laser therapy are the basic tools that I utilize for my patiens with arthritis. Prolotherapy and stem cell therapy very successful, but are more “invasive” interventions, and must be done with sedation or anesthesia, so are not suitable for all pets. Massage is wonderful because it is usually available from travelling therapists who will come to your home. Some massage techniques are also very easy to learn to do yourself, and are a special close bonding experience for you and your dog or cat. Herbal and nutritional interventions such as high levels of omega-3’s from fish oil, green-lipped muscle extract, cucurmin (turmeric extract), MSM, glucosamine etc. can be very effective in reducing the pain and mobility restrictions of arthritis. Physical therapy is also a very valuable part of a multi-modal approach to arthritis, to help strengthen muscles and the tissues that support the joints. All of the injuries and disorders that can cause human beings pain can cause pain in animals. Complementary therapies for pain such as acupuncture, massage, cold-laser therapy and herbal medicine can safely combine with or even replace the use of painkillers such as opiates, non-steroidal anti-inflammatories (NSAIDS) and other pharmaceuticals. Recently there has been media attention to an issue that has been building over the past two years. Urban wildlife, including raccoons and skunks, are becoming sick and dying from a virus that also causes disease in companion animals such as dogs and ferrets. Distemper virus is still very present in our environment. This has made the issue of vaccinating companion animals against distemper prominent, and I get questioned regularly on the pros and cons of vaccinations. This is not a simple issue. There is ample evidence that overvaccinating contributes to an increase in chronic health disorders. On the other hand, having a pet permanently disabled or dead from a potentially preventable disease is definitely not desireable. If you see a wild animal acting unusually, kepp your pets secure and stay well away, then call Toronto Animal Services for instructions. There is great upcoming opportunity available, but only to the first 12 people to respond! Hilary Watson, veterinary nutritionist, and Janet Craig, a licensed chef, are offering Canine Culinary 101, a workshop to train owners how to prepare home-cooked dog food recipes safely and in bulk using a community kitchen. Normally these classes cost $55 per person; you receive 4 kilograms of food at the end of class. A private class is being planned for Dr. Sherebrin and her clients, at a special reduced ratre of $10 per person. A 3-hour cooking workshop AND 4 kilos of healthy prepared dog food for only $10.00! If you need to purchase a jar of Hilary’s Blend supplement, please let me know ASAP to allow time to order in stock. No experience necessary! Novices very welcome! are as committed to their dog’s health as you are! Pass this message along to any others who may be interested. Stem Cell Therapy- Is it right for your pet? Stem cell therapy is a very exciting, relatively new treatment for arthritis. It has only became available in Canada about 18 months ago, and is definitely living up to the hype! Large joints such as the elbow, shoulder, hip, and knee are currently available to be treated in private practice. The spine is in investigational treatments at this point, as techniques are being refined. But is is not the right procedure for every pet. It requires a general anesthetic for the initial tissue harvest, then sedation 2-3 days later for implantation of the stem cells in the joint. Pets must be in good health other than the arthritis, as evidenced by blood tests. Other requirements are a stable joint, as instability as is the case with an anterior cruciate (knee) ligament (ACL) rupture will interfere with the effectiveness of the procedure. The joint also needs to be accessible- the stem cells are injected into the joint space through a needle- so very obese patients or those with calcifcation of the joint capsule can be much more difficult for correct placement of the injection. Recently there has been media attention to an issue that has been building over the past two years. Urban wildlife, including raccoons and skunks, are becoming sick and dying from a virus (canine distemper virus) that also causes disease in companion animals. This has made the issue of vaccinating companion animals prominent, and I get questioned regularly on the pros and cons of vaccinations. This is not a simple issue. There is ample evidence that overvaccinating contributes to an increase in chronic health disorders. On the other hand, having a pet permanently damaged or dead from a preventable disease is something most people want to avoid. Over-vaccinating can pose significant health risks, including over-stimulation of the immune system resulting in allergies, recurrent skin and ear infections, immune mediated diseases (such as thrombocytopenia or hemolytic anemia), as well as certain kinds of cancer. “What to vaccinate for” and “how often to vaccinate” remains a controversial topic amongst veterinarians. Many veterinarians are now changing their protocols based upon clinical studies that show that many vaccines labeled to be given annually actually provide protection for a much longer period of time. Due to increased pressure from enlightened veterinarians and pet guardians, pharmaceutical companies are now making vaccines that are licensed and labeled for 3 year duration of immunity. The Rabies Challenge Fund Charitable Trust raises money to support research on rabies vaccine duration of immunity. The goal is to extend the required interval for rabies boosters to 5 and then to 7 years. This project depends primarily upon grassroots gifts for funding the costs of conducting the requisite vaccine trials. Annual vaccination is NOT required by law in Ontario. Compulsory rabies vaccination is governed by Ontario Regulation 567/90, which requires all catand dog owners to ensure that their pets are immunized against rabies. Under provincial legislation, a pet is considered vaccinated against rabies if the time that has elapsed since the vaccination was given is less than the duration of immunity as set out on the vaccine’s label. Regular physical examinations (once a year up to age 6, then two to four times a year for senior pets) to optimize health and maintain balance. Supporting your pet’s immune system using nutrition, acupuncture and herbs. Individualized vaccine protocols based upon your pet’s risk of exposure, age, lifestyle, and health. Checking antibody* levels (titres) annually and only vaccinating when levels are low. Using thimerisol (mercury) free vaccines wherever possible. Using adjuvant free vaccines to reduce the risk of vaccine-associated sarcomas (cancer). Using 3 year labeled vaccines when available. Puppy and kitten core vaccines given at about 12 weeks of age, boosted 3-4 weeks later, and again 1 year later. Vaccinating for rabies is the law and is given every 3 years where possible, unless the pet has had a documented vaccine reaction. Vaccination for FIV is not indicated at this point in time as the vaccine is only partially effective, and there is no test that differentiates a vaccinated cat from an infected cat. Vaccination may increase the euthanasia rate of stray/homeless cats at shelters due to positive FIV tests in vaccinated cats. Avoid vaccinating pets when they are sick, as this could result in worsening of their current condition by creating more stress on an already burdened immune system. In addition, certain antibiotics inactivate Bordatella vaccine, making it ineffective. Canine corona virus vaccine is not indicated at this time because studies show that many dogs that are exposed to the virus do not develop any evidence of disease (enteritis, diarrhea), and many infected animals have very mild clinical signs that are self-limiting and resolve on their own. *Antibodies are immune proteins that neutralize specific foreign materials such as viruses or bacteria in the body. They form part of what is called the “Humoral” or “Memory” immune system response. The body retains a “memory” of prior exposure to foreign material so it can quickly neutralize it at future exposures. There are 2 other components to the body’s immune response, called the “Cellular” and “Mucosal” systems. Unfortunately, tests of the latter two systems are not available at present.